Classic guest bath remodel "AFTER"
A home owner asked me to help her update her guest bath in an older ranch style house. Looking around her the house, I saw she had decorated in a more traditional style. She asked for the new design to be more contemporary, but classic and timeless. The long, narrow space, 4 feet by 10 feet, was a challenge. We removed the old tile shower and wing wall, and replaced it with a soaking tub and shower. 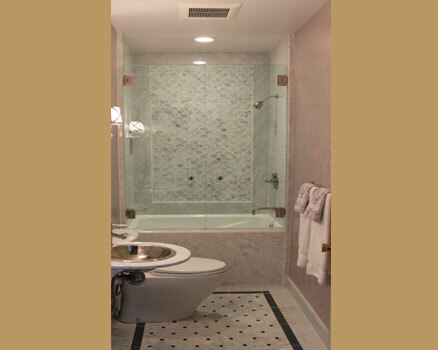 The frameless shower doors allow the feature fan tile on the back wall to draw your eye into the depth of the room. A small, wall hung sink keeps the space open. We had a custom marble top and splash fabricated. The wall sconces and mirror complete this vignette. The clean lines of the toilet continue this minimalist design. I took the home owner to several showrooms to look at tiles, stone materials, wallpaper and plumbing fixtures. Looking at these materials together helped me to understand what she liked. I developed 3 design concepts for her to review that included material samples and scale drawings. She selected this concept. The subtle shades of white and gray of the Carrera marble is complimented by the muted purple wallpaper. The chrome in the wall sconces and plumbing fixtures add a touch of sparkle. A classic and timeless design was achieved by using Carrera marble in the different tile shapes, and on the other surfaces, i.e. the sink, tub skirt and baseboards, thus diminishing the length of the room and creating a cohesive and inviting bathroom. The home owner was very happy with the completed project, and proud to share it with her guests.